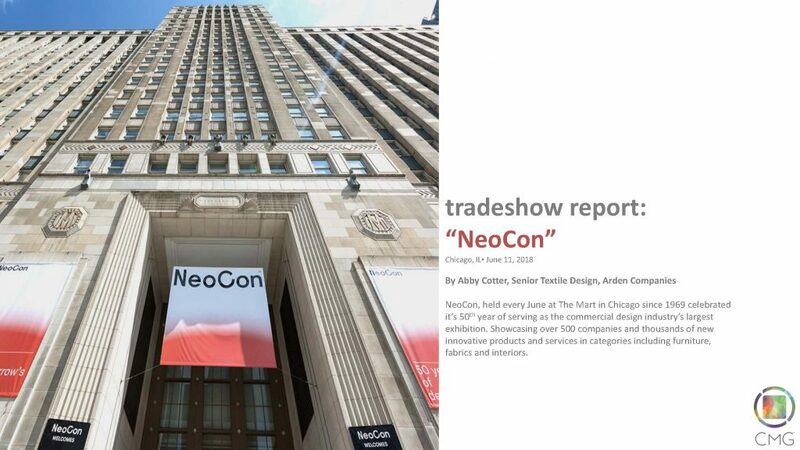 DID YOU MISS NEOCON THIS YEAR? WHAT ABOUT SALONE DEL MOBILE? CMG members get exclusive access to Roving Color Reports from trade shows and markets around the world. CMG’s Roving Reporters share information as they travel to trade shows and markets around the world. They take photographs, compile short reports, and write brief descriptions of each trend with corresponding images. Each Report focuses on the top ten color and design trends that they feel would be of value and interest to CMG members. The final Reports are shared with CMG’s members. CMG’s Roving Reporters receive a complimentary Press Pass to assist with the application for media credentials to the Trade Show. Not a member of CMG? Consider joining – Roving Reports are another great example of how our members Connect in Color! Want to be a CMG Member Roving Reporter? Contact Sharon Griffis at sgriffis@colormarketing.org for more information.